Integrated Fire Protection Pvt. Ltd. is having the stat of art testing facilities laboratory in the field of testing of fire fighting foam concentrates, dry chemical powders, extinguishers etc. as per Indian and international Standards of repute. 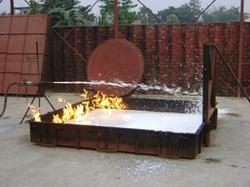 Test facilities for foam concentrates, dry powder, extinguishers and foam equipments.